Of all the planets in the solar system, the tiny dwarf planet Pluto captures people's attention like no other. For one thing, it was discovered in 1930 by astronomer Clyde Tombaugh. Most planets most planets were found much earlier. For another, it's so distant no one knew much about it. That was true until 2015 when the New Horizons spacecraft flew by and gave gorgeous close-up images of it. However, the biggest reason Pluto is on people's minds is for a much simpler reason: in 2006, a small group of astronomers (most of them not planetary scientists), decided to "demote" Pluto from being a planet. That started a huge controversy that continues to this day. Pluto is so far away that we can't see it with the naked eye. Most desktop planetarium programs and digital apps can show observers where Pluto is, but anyone wishing to see it needs a pretty good telescope. The Hubble Space Telescope, which orbits Earth, has been able to observe it, but the great distance didn't allow a highly detailed image. Pluto lies in a region of the solar system called the Kuiper Belt. It contains more dwarf planets, plus a collection of cometary nuclei. Planetary astronomers sometimes refer to this area as the "third regime" of the solar system, more distant than the terrestrial and gas giant planets. 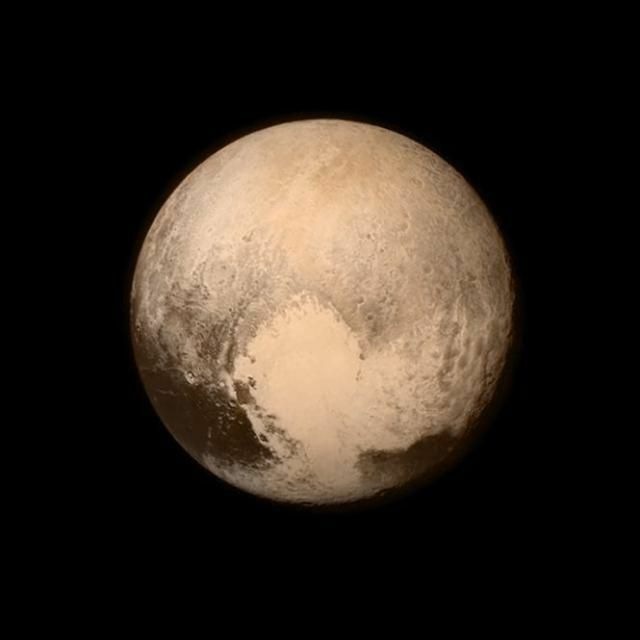 As a dwarf planet, Pluto is obviously a small world. It measures 7,232 km around at its equator, which makes it smaller than Mercury and the Jovian moon Ganymede. It's much larger than its companion world Charon, which is ​3,792 km around. For a long time, people thought Pluto was an ice world, which makes sense since it orbits so far from the Sun in a realm where most gases freeze to ice. Studies made by the New Horizons craft show that there is indeed a lot of ice at Pluto. However, it turns out to much denser than expected, which means it has a rocky component far beneath the icy crust. Distance lends Pluto a certain amount of mystery since we can't see any of its features from Earth. It lies an average of 6 billion kilometers from the Sun. In reality, Pluto's orbit is very elliptical (egg-shaped) and so this little world can be anywhere from 4.4 billion km to just over 7.3 billion km, depending on where it is in its orbit. Since it lies so far away from the Sun, Pluto takes 248 Earth years to make one trip around the Sun. Once New Horizons got to Pluto, it found a world covered with nitrogen ice in some places, along with some water ice. Some of the surface appears very dark and reddish. This is due to an organic substance that is created when ices are bombarded by ultraviolet light from the Sun. There's a great deal of fairly young ice deposited on the surface, which comes from inside the planet. Jagged mountain peaks made of water ice rise up above flat plains and some of those mountains are as high as the Rockies. So, what causes ice to ooze up from underneath Pluto's surface? Planetary scientists have a good idea that there's something heating the planet deep within the core. This "mechanism" is what helps pave the surface with fresh ice, and shoves up the mountain ranges. One scientist described Pluto as a giant, cosmic lava lamp. Like most other planets (except Mercury) Pluto has an atmosphere. It's not a very thick one, but the New Horizons spacecraft could definitely detect it. Mission data show that the atmosphere, which is mostly nitrogen, is "replenished" as nitrogen gas escapes from the planet. There's also evidence that material escaping from Pluto manages to land on Charon and collect around its polar cap. Over time, that material is darkened by solar ultraviolet light, too. Along with Charon, Pluto sports a retinue of tiny moons called Styx, Nix, Kerberos, and Hydra. They're oddly shaped and appear to be captured by Pluto after a gigantic collision in the distant past. In keeping with naming conventions used by astronomers, the moons are named from creatures associated with the god of the underworld, Pluto. Styx is the river that dead souls cross to get to Hades. Nix is the Greek goddess of darkness, while Hydra was a many-headed serpent. Kerberos is an alternate spelling for Cerberus, the so-called "hound of Hades" who guarded the gates to the underworld in mythology. What's Next for Pluto Exploration? There are no further missions being built to go to Pluto. There are plans on the drawing board for one or more that could go out this distant outpost in the solar system's Kuiper Belt and possibly even land there.